Accepts tape widths of 1"-3"
Tape length - Up to 30"
Tape length - 6" - 45"
International Plastics offers repair and service on every Better Packages Water activated Tape dispenser. EVEN THE ONES WE DON'T SELL. 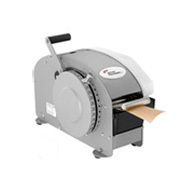 We believe so strongly in the Better Packages product and our customer service that we offer service and repair on ANY Better Packages Tape dispenser. Better Pack brand gummed tape dispensers incorporate safety features you won't find in any other manual or electronic dispenser. The electronic models are built to meet or exceed UL, CE and CSA regulatory requirements for electronic and operational safety. As package tampering and theft increase, so do the package security demands of today's businesses, government agencies and consumers. One of the easiest, most cost effective ways to increase package security is to use a tamper-evident seal. Water-activated tape is one of the best sealing methods for doing just that. Better Packages For nearly 95 years, packaging professionals around the world have made Better Packages their first choice for simple, safe and secure packaging solutions. WHICH DISPENSER IS RIGHT FOR MY PACKAGING NEEDS? 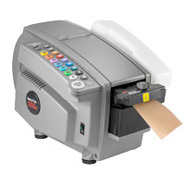 The best dispenser for you depends on the type of products you are shipping, the volume of packages being sealed, the size of your shipping cartons and the nature of your work force. Better Packages has the widest range of dispensers and options available from a single manufacturer. From a simple pull and- tear model for extremely low-volume carton sealing needs to manual non-electric models for moderate volumes to automated carton sealing systems for the highest volume shipping applications, Better Packages offers the dispenser and options that will match your needs. IS THE DISPENSER EASY TO OPERATE? To ensure maximum productivity, a dispenser must be easy to learn and operate. Better Packages offers simple, highly functional dispensers with features like the fluid handle motion on Better Pack 333, which can be set for exact lengths, and push-button operation on electric models. 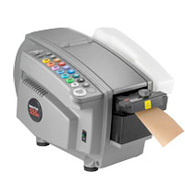 Accessories such as the foot pedal and AMD (Automatic Measuring Device) further ease use by providing hands-free dispensing and automatic carton measuring. IS THE PRODUCT SAFE? 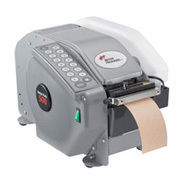 Tape dispensers are mechanical devises and safety features must be built in to protect the operator. Better Pack brand dispensers incorporate safety features you won’t find in other manual or electronic dispensers. Better Pack electronic models are built to meet or exceed UL, CE and CSA regulatory requirements for electronic and operational safety. Steel side frames, flame retardant materials, thermal cutoffs and low voltage heaters are just a few of the features you should look for to ensure your operators are protected. The Better Pack 555e Series is the only electric dispenser to be UL Approved and Listed. WILL THE DISPENSER BE RELIABLE? A malfunctioning dispenser can shut down an entire shipping operation. Better Packages dispensers have been extensively tested and proven in the highest volume shipping applications for over 90 years. Customers like QVC®, J. Crew®, Tiffany®, Land’s End®, Frito-Lay®, BMW® and Avon® have been relying on Better Packages dispensers to keep their packing lines flowing 24/7. HOW LONG SHOULD I EXPECT THE DISPENSER TO LAST? The capital equipment required to keep a packaging line running at peak efficiency represents a significant investment for any organization. It is critical that the equipment is around long enough to provide a return on that investment. 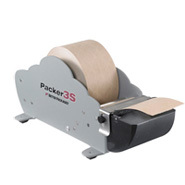 Better Pack brand dispensers are engineered for consistent performance and are built to last. The average age of its electric models in use today is over 16 years; its manual models average over 20 years in service. DOES THE MANUFACTURER STAND BEHIND THE PRODUCT? For continual maximum efficiency, production equipment must be easily supported and maintained. For over 90 years, Better Packages’ exceptional products and service have made the company the world’s leading manufacturer of water-activated tape dispensers and carton sealing systems. Better Packages dispensers are sold and serviced by a global authorized distributor network and come standard with the best warranty in the industry: 2 years on parts, 6 months on labor. With more than 500,000 dispensers in use, the Better Packages brand has become synonymous with unmatched innovation, design, quality and reliability. WHAT HAPPENS IF THE DISPENSER REQUIRES PARTS OR SERVICE? Most every mechanical equipment needs replacement parts or service at times during its useful life. Easy access to parts and a quick response from an experienced service resource are mandatory to ensure maximum productivity. The Better Packages global network of authorized distributors provides the most comprehensive service and support in the industry and Better Packages carries an extensive inventory of standard replacement parts needed with normal use of the dispenser. The following suggested preventive maintenance schedule applies to all water-activated tape machines listed on interplas.com. Wash water brushes with mild soap; rinse well. Clean any accumulated tape dust with a dry brush or blower. Wash water tank with mild soap; rinse well. Clean accumulated glue from blades using a scraper. (Don’t scrape the cutting edge because the blade may become dull and need replacement.) Caution: The blade is sharp and can cut easily, so be careful working around it. Apply light coating of light machine oil to back of blade. On Better Packages 555 models add a few drops of light machine oil to felt pads. Thoroughly clean all accumulated pieces of tape, tape dust and any other foreign material from inside of machine with dry brush or blower. Clean bottom of heaters and pressure plates of accumulated glue. Oil upper and lower blades lightly with light machine oil. Clean all covers with a damp rag. The following are simple troubleshooting tips to consider if there is a problem with your machine. A more complete discussion of troubleshooting techniques is contained in the operating manual for each machine. If the problem with your machine cannot be resolved with these tips or techniques in your manual, then you should contact your local authorized distributor or our Customer Support Department through Contact us. Symptom: Machine does not turn on (if electric). Check to see that unit is plugged in, and power light is "on." Symptom: No tape is dispensed. Check to see that tape is loaded in the basket. Check to verify the tape path is correct. Remove upper tape plate and look for small pieces of tape which may cause jamming. Check that the water brush(es) and water tank are properly inserted so they don't block the tape path. Symptom: Tape is not wet when it is dispensed. Check for proper location of water brush(es) and tank. Check brushes for excess glue build up or excess wear. Symptom: Tape does not stick well. Tip(s): Check water level, adjust if necessary. Check heater operation, adjust if necessary. Add water conditioner if water is "hard." Check condition of water brushes.